The following is a list of the 10 highest paying superfectas in Belmont Stakes history. 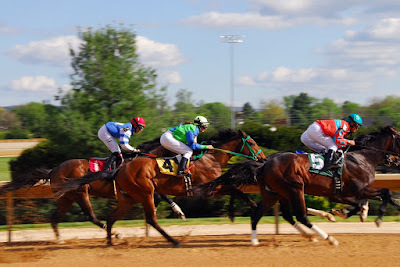 The Belmont is the third leg of the Triple Crown, and it is run annually at Belmont Park in Elmont, New York, exactly three weeks after the Preakness and five weeks after the Kentucky Derby. In order to win a superfecta wager, bettors must select the first four finishers in a race in exact order. All superfecta payouts listed below are for a $2 bet. I've listed all the superfectas in Belmont Stakes history that paid over $10,000 at Belmont Park. In the past, some racetracks would have their own betting pools for big races like the Belmont, so they would have different payoffs. Today, all the money bet on the Belmont at all the different racetracks goes into the same betting pools at Belmont Park so all the payoffs are the same around the country. In terms of the Triple Crown races, the supefecta payoffs in the Belmont are below the highest superfecta payouts for the Kentucky Derby, but well above the highest payouts for the Preakness. The highest paying superfecta in Belmont Stakes history came in 2002, when the winning combination of Sarava first, Medaglia d'Oro second, Sunday Break third, and Magic Weisner fourth paid $145,334.00 for each $2 winning ticket. War Emblem was a heavy 1.25 to one odds favorite in the 2002 Belmont, after he had won both the Kentucky Derby and the Preakness. In the race, War Emblem had a bad break, but remained in contention until the horses hit the turn into the stretch and then he tired badly to finish eighth in the 11 horse field. Sarava went off at odds of 70.25 to one, and paid a whopping $142.50 to win, the highest win price in Belmont Stakes history. Second place finisher Medaglia d'Oro went off at 16.00 to one odds, while third place finisher Sunday Break was 8.10 to one odds, and Magic Weisner finished fourth at odds of 7.30 to one. The loss in the Belmont ruined War Emblem's Triple Crown bid, and I'm sure ruined trainer Bob Baffert's day. The second highest paying superfecta in the Belmont came in 2011, when Ruler on Ice (24.75 to one odds) came in first, followed by Stay Thirsty (16.20) in second, Brilliant Speed (10.90) in third, and Nehro (4.90) in fourth to pay $74,052.00 for each $2 wining bet. The superfecta paid so much in 2011 because both the Kentucky Derby winner, Animal Kingdom, and the Preakness winner, Shackleford, did not finish in the top four. When Da 'Tara won the 2008 Belmont at odds of 38.50 to one, he keyed the third and fourth highest superfectas in the race's history. Denis of Cork (7.20 to one odds), ran second in the race, while Anak Nakal (34.25) and Ready's Echo (28.75) dead-heated for third place. Due to the dead-heat for third, there were two superfecta payoffs in the 2008 Belmont. The $48,637.00 payoff had Anak Nakal in third, and Ready's Echo in fourth. Big Brown came into the 2008 Belmont having won both the Kentucky Derby and the Preakness. He was a huge favorite (.30 to one odds) in the race, but Big Brown was pulled up as the horses entered the stretch, becoming the first horse with a chance to win the Triple Crown to ever be pulled up in the Belmont. I was not a Big Brown fan, and I felt Da 'Tara could get an easy lead in this race and I bet him to win. I was thrilled when he won and paid $79.00, but I did not bet the superfecta. As mentioned above, the 2008 Belmont had two superfecta payouts due to a dead heat. The superfecta with Ready's Echo in third and Anak Nakal in fourth paid $47,309.00, the fourth highest superfecta payout in Belmont Stakes history. The 2005 Belmont produced a $14,249.00 superfecta that any racing fan could have had. That is because the heavy favorite in the race, Afleet Alex at odds of 1.15 to one, won the race. Andromeda's Heron (11.90) ran second, while Nolan's Cat (20.50) ran third, and Indy Storm (17.10) ran fourth. All one had to do to hit this superfecta was to have Afleet Alex on top, and then use the all button for other three spots. When Birdstone rallied in the stretch to win the 2004 Belmont by a length at long odds, he not only denied Smarty Jones the Triple Crown, he also keyed a big $11,679.00 superfecta. Birdstone went off at odds of 36.00 to one, while Smarty Jones was the heavy favorite at .35 to one in second, Royal Assault ran third at 27.75 to one, and Eddington ran fourth at odds of 14.20 to one. The 2010 Belmont, which was won by Drosselmeyer, paid $10,658.00. Drosselmeyer went off at odds of 13.00 to one. Fly Down (5.20) ran second in the race, with First Dude (5.90) running third, and Game On Dude (17.00) completing the superfecta in fourth place.